The Best of ASCO Lebanon Opening Ceremony featured presentations by (left to right) Dr. Fadlo Khuri, Dr. Nagi S. El Saghir, Dr. Raymond Sayegh, Dr. Joseph Makdessi, and Dr. Nizar Bitar. The Best of ASCO® Lebanon tradition continues to go strong. For the 11th year in a row, the Lebanese Society of Medical Oncology (LSMO) organized its annual Best of ASCO meeting, licensed by ASCO, at Phoenicia Hotel conference center in Beirut, Lebanon, on September 2-3, 2016. After months of preparations, the Planning Committee was happy to welcome 315 attendees from Lebanon and neighboring Arab and Middle Eastern countries. In fact, we had speakers and attendees from Syria, Iraq, Jordan, Egypt, Qatar, United Arab Emirates, Saudi Arabia, Iran, Belgium, France, and the United States. The meeting included presentations of 54 abstracts (first presented at the 2016 ASCO Annual Meeting in Chicago) at interactive sessions with questions, answers, and comments, as well as summaries of two Education Sessions related to genetic and genomic mutation and immunotherapy. Most noticeably, our Best of ASCO 2016 was attended by a large number of young oncologists and fellows and residents in training. The majority of those young and in-training oncologists are not able to attend the ASCO Annual Meeting in Chicago, either because of the costs or because of their schedule. They all said, “It almost felt like we had been to ASCO in Chicago.” Even for those of us who were in Chicago, attending Best of ASCO allows us to hear educational material tailored to the unique needs of our region, and it is always nice to listen to new research twice! 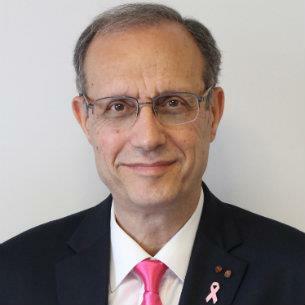 Oncologists practicing in Lebanon and other Arab and Middle Eastern countries, like many oncology leaders worldwide, take advantage of local Best of ASCO meetings to gather with oncologists and key physicians in our countries and regions to address pressing issues related to our profession and to patient care. In Lebanon, we organized an Opening Ceremony where LSMO President Joseph Makdessi, MD, Lebanese Order of Physicians President Raymond Sayegh, MD, American University of Beirut President Fadlo Khuri, MD, and I spoke about medicine in Lebanon, oncology practice, the availability of new diagnostic modalities, new surgical and radiotherapy techniques, oncology teaching, training, and curriculum, and research, in addition to addressing the burdens of new, expensive cancer drugs. While talking about new and very costly immunotherapies for lung cancer, we reminded everybody that we should increase our efforts to curb smoking and so prevent 90% of lung cancers. For instance, we proposed a worldwide raise of the price of each pack of cigarettes such that it would be beyond the capacity of teenagers to buy it, and to increase awareness and early detection to prevent advanced disease and decrease the use of these and other costly drugs. On a final note, at the McCormick Place Convention Center in Chicago, between the halls and the conference rooms, one walks several miles a day, and at times must even run, to attend various lectures at the ASCO Annual Meeting. At Best of ASCO, you sit back, relax, and enjoy the presentations!